Lauren Fendrick: Brasilia and Raw Sugar Cane!! Brasilia and Raw Sugar Cane!! 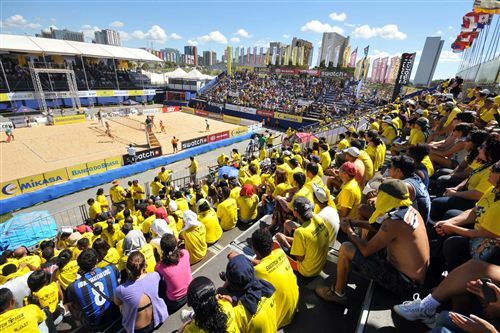 It was the 50th Anniversary of the architecturally futuristic fuselage designed city and the FIVB took full advantage featuring the first day of the main draw during the city's celebration. There were an estimated one million people in the plaza that day, many eager to watch their country compete against the world in the country's beloved sport of beach volleyball. In the morning that day I remember following the path of my pass up into the sky and seeing more paragliders up there than sky!! Yet they weren't paragliders per se because they had fans attached to the seats creating self-propulsion instead of relying on wind gusts. Later that afternoon, Brazilian beats and vocals pulsed through the tournament with a jet air show in between sets. I was able to purchase and experience a couple of Brazil's prized treasures fugo de chao, guarapa and perfectly flattering bikinis. While extremely over-priced as I could never eat my money's worth there, I've never seen quite the level of service as I did at fugo de chao. I also discovered an amazing new juice: fresh guarapa (raw cane juice)! At a small stand I watched a machine freshly press the raw cane like pressing a fresh fruit. It was delicious, fresh and refreshing. It quickly became my favorite post-workout replenisher. I was bummed to leave this treasure behind but then Tuesday at the farmer's market I came across Raw Cane Juice at the Manhattan Beach farmer's market. They have a variety of flavors, even a master cleanse variety made with raw sugar cane. My favorite is the alkalizer which helps balance your pH which can be thrown off by eating meat and cheese. And of course, I indulged in some cheap bikini bottoms that fit great! Why can't american designers figure this out!! Excited for Santa Barbara this weekend and Shanghai to follow!